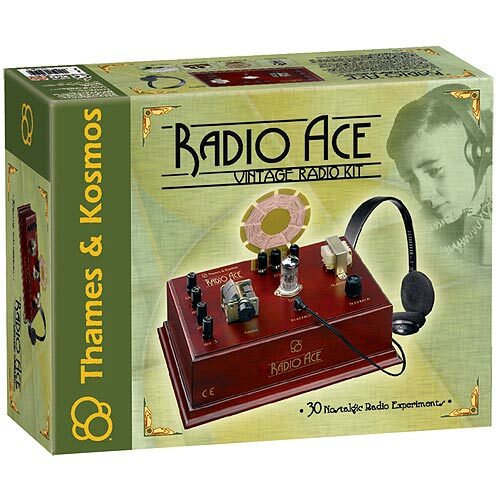 Build a nostalgic radio with a real vacuum tube and explore the airwaves as they did in the 1930's! Historic technology comes to life again with 30 engaging experiments. Assembling this radio is a fun project for radiomen, tinkers and gadget-buffs of all ages. Once your radio is up and running, hunting for radio transmissions becomes a fun challenge. While learning how the radio works, you will discover the fundamental parts of electrical circuits. The radio is pre-wired for easy assembly. Users need only to plug in the various components, attach an antenna and a ground wire, and make tuning adjustments to get the radio working. The wooden base is beautifully finished with a polished cherry stain and golden labels for an authentic look. The vacuum tube glows with a soft orange glow when you are using it! 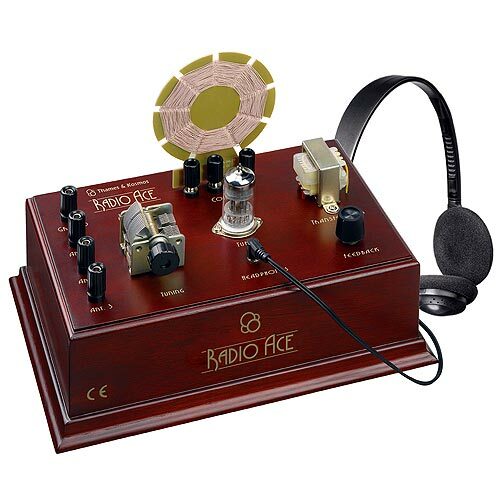 Transport yourself back to the early days of radio, and become a real Radio Ace!